I heard a speaker talk about how she has her moments when she allows herself to binge and indulge. She said, “I’m a human being, being human.” (Thank you Tulin Emre for that little nugget). A lot of what she said today was amazing and powerful and all the tears weren’t just because of the pregnancy hormones. A couple of days ago, I was watching some Instagram stories from another amazing speaker that I admire and was catching them right before they disappeared. I’m talking about the fact that the time of when she posted them said “1d” and were almost gone! She was talking about a common phrase that she hears daily and what she said really got me thinking aboutmyself. She said that she hears all the time how she is so inspiring and motivating but they could never do what she does because they don’t have a weight loss transformation or financial transformation. They aren’t a great public speaker like her. They can’t share their story like she does. I’ve often thought the same thing about not having a transformation. 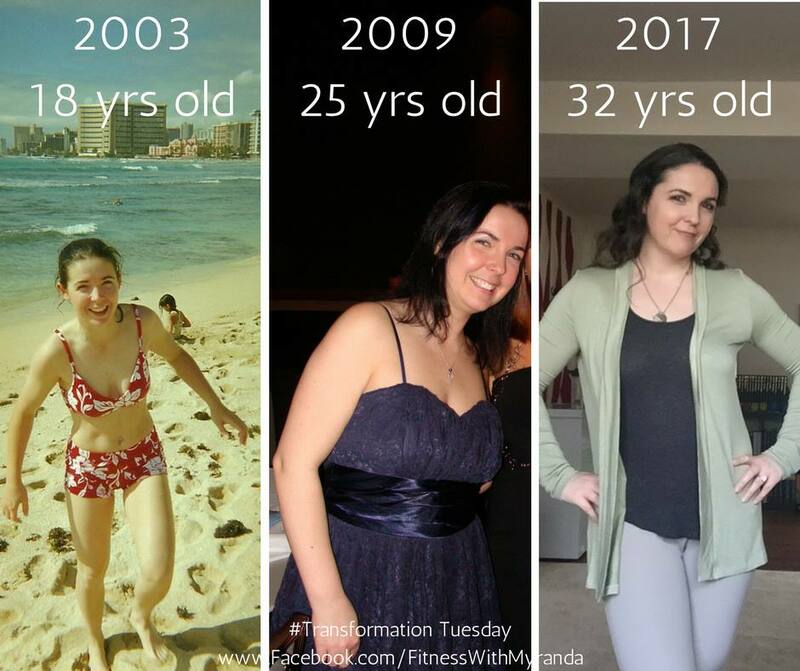 I haven’t had a huge weight loss and definitely don’t have a huge financial transformation and I really haven’t figured out how to share my story. I can share about my journey with food! Let me tell you a little story. You may have seen this on some platform of my social media. If not, let me tell you a little about this. At 18 years old, the pic on the left, I was in Hawaii with my crew and cutter. This was January and I had been living on my own for a grand total of 2 months (not counting the 2 months I was in boot camp). I was living like I had not a care in the world. I was picking up some very bad habits as well. I was drinking, smoking, and eating junk all the time. Let me back it up and just say that when I was in high school, I was pretty much a clean eater. I reached for fruit as a snack instead of chips, I would drink water instead of soda, I ran daily unless I was actually really sick. So being free to buy my own food, any kind that I want, and eat out when I wanted, I started to spiral. I managed to keep my slim figure for years. It wasn’t until about 2006 that I started to gain weight. The next thing I knew, I had gone from a size 0 to a size 8 and from 118lbs to 148lbs. I was miserable. I tried counting calories. I tried working out. What I was doing wasn’t working because it wasn’t the calories I was counting, it was the food I was eating. I was still eating crap food. That leads me to the picture in the middle. This picture was taken at a Christmas party in 2009. I had been working out and trying to eat better for over a year. In the summer of 2008, I was at my heaviest and my husband (now ex) and I wanted to have children. I was worried that I couldn’t keep up with my future children. I got winded when I went grocery shopping. I found a website that started to help me figure out how to eat better and track what I ate and track my workouts and in this picture I was about 137lbs. I felt great, or so I thought. Then I got divorced in 2011. I dropped a ton of weight, was back down to 120lbs or lower, I was still smoking and eating terrible. Dinner was regularly frozen pizzas and booze. Lunch was a giant Monster and three taquitos from the local gas station. Breakfast…what was that?! After a few back injuries, I ended up gaining weight and then got stuck. In 2014 I found Beachbody and 21 Day Fix. I followed this program to a T and fell in love with the containers and meal planning. This leads me to the picture on the right. Last year, I was feeling great! I was starting to like what I saw in the mirror. I don’t know what my weight was but that’s okay. I didn’t really care as long as I loved what I saw in the mirror. Now, I don’t have a current picture because I don’t feel comfortable in my own skin. I am about 6 months pregnant. I haven’t worked out during this pregnancy. I haven’t been giving in to every unhealthy craving but I haven’t been eating the best either. I feel like I’m starting all over again. I need to change my mindset about food and that has lead me to this post. I have found a way to change my mindset and relationship with food. I am so eager to start and I’m looking for some accountability. If you’re in the same boat as me and want to change your relationship with food, fill out this form and join me. What’s great about this group is that working out is not required and considered “extra credit”. I know that I have no energy to work out so I’m going to be focusing on food only.